Configure Hunt Group Queue statistics / status on Cisco IP Phone for the calls coming into hunt pilot queue which will help you to know how many calls are waiting into the Queue. This helps supervisor or agents to monitor the queue, understand the peak hours when most of the call comes into the queue, planning and deploying the resources accordingly. Follow below steps to configure queue status. In our below configuration, we will use Cisco 9971 IP Phone as a reference for sample configuration. 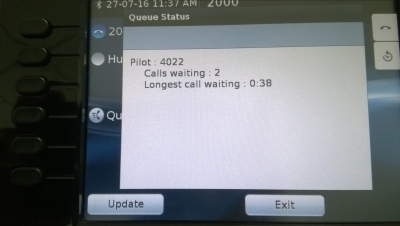 Once the IP Phone is up, you can press Line 3 button to see the number of calls waiting into the hunt pilot queue. Make a call to the pilot number and let one of the agent answer the call. Now press Queue Status on IP Phone button > It should show the number of calls waiting as 0. Do not hang up the call. Make another call from a different phone to the same pilot number and press on Queue Status and now it should say the number of call waiting is 1. Click on Update to refresh the number of calls waiting. Note : Queue status is supported only on the following IP Phones for SIP and SCCP protocols. so,i need to know the way you told me , can we get Events of that ? Queue status events ? I am not sure if there is a way to do that but you can definitely get the reporting from RTMT or via SQL. I have written a post on how to get the information like calls abandoned, number of calls in queue, longest call waiting etc via RTMT. You may refer to the below post. Excellent blog, many thanks for the content. I notice that you explicitly state that this implementation will only work on older Cisco endpoints. Is there a similar solution that would be available for 78xx and 88xx series Cisco endpoints? I had 9951 and 9971 IP Phones and tested the configuration which worked. I don’t have 78xx and 88xx IP Phones as of now and hence cannot confirm you if the same setting works? I am not aware of any other solution or approach which would work for 78xx or 88xx series endpoints. If you have 78xx or 88xx series, you can give it a try with the same configuration and see if it works? Let me know if you get a chance to do that. I’m trying to setup a queue which will ask the costumer after 5 minutes holding if he would like to continue holding or leave a voicemail. the problem would be: – maintaining place in line – on the hold queue. Is it possible without UCCX scripting? I only got CUCM and Unity.